Allison Flint and her friends revisit an old childhood haunt for the first time in over a decade. Bog Road runs from Washburn Corner and McDaniels Marsh in Springfield north to Enfield Center, and a large, wooden Fish and Game Department sign marks the trailhead to the pond. 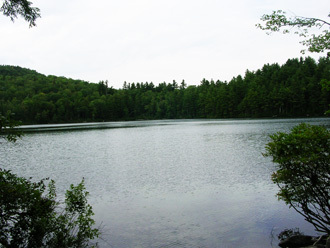 When I was a kid, I often hiked to Cole Pond with my friends for swimming and overnight camping. Trudging and sometimes wading through what we called the “bottomless bog,” we would arrive at the pond covered in black mud smears and usually a wet sneaker or two. It was always quite the adventure and quite scary at times, which added to the thrill of course. This summer I had a chance to relive these memories, when for the first time in many, many years, I returned with my childhood friends, no less enthusiastic as the girls we were 35 years ago. The Cole Pond trail is managed now by the NH Fish and Game Department, and since I was a child, the route has been redirected around the bog, rather than through it, and carefully groomed for easy walking. I was at first disappointed by the lack of bog mess, but then relieved that I wasn’t in for an evening of sneaker cleaning when I returned home. As we made our way up the hillside, my friends and I chatted about our childhood trips and reminisced. Cindy had brought her own teenage children along and they hung back and enjoyed our wistful memories of our childhood days. But as adults, especially moms, aren’t cool to teenagers, our excitement was more amusing to them than thrilling. The trail leveled off, the trees thinned, and we emerged to see the pond in front of us. It did not look small, as places often do when you revisit them as adults; it definitely was something. It was opportunity for memories, both faded and newly made. For sharing an experience, an afternoon, a granola bar with friends, reliving the simplicity of our childhood. 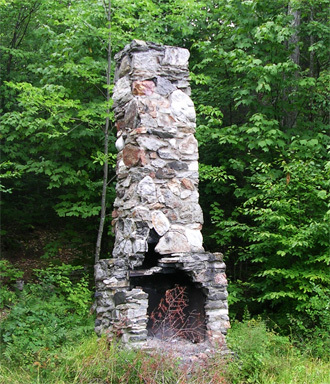 The old chimney, long abandoned after a fire claimed the cabin it served and that cast long shadows all those years ago, still stood by the lunch rock. The exhilarating rope swing which burned our hands and dumped us into trees and rocks so long ago was no longer there, but a safer alternative, with better engineering, had replaced it across the clearing. In an exploration around the pond, we came upon 6 boats - canoes and rowboats - in various states of use, but all left there intentionally. Cole Pond is a fishing haven for those who long for remote fly-fishing waters, being abundantly stocked with trout. The fish population is carefully managed and even stocked by helicopter every summer. There are fishing limits and fish size requirements in an effort to naturally populate the pond. I can only imagine the anticipation these fishing junkies felt as they carried or dragged their boats up to the pond. Since motorized vehicles are not allowed, their labor must have been inspired by the love of a good fish. Cole Pond is a treasure in the woods, yet accessible to all ages, from infants in backpacks to older hikers still eager to get outdoors and see and experience the beautiful New Hampshire landscape. It’s worth the trip, and you won’t have to wash your shoes. 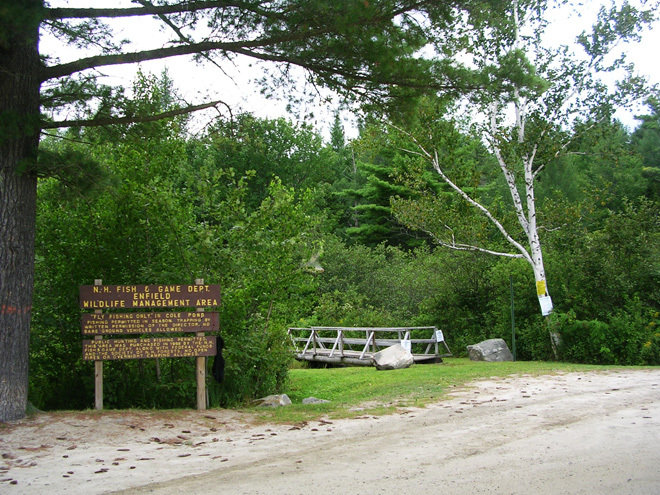 The trail head can be found on Bog Road, Enfield, New Hampshire.